The PCS is organising protests around the country this Friday March 31st on the last payday before the new financial year begins. “The payday protests, which are happening ahead of the publication of the Treasury’s pay guidance for 2017, are your chance to drive home our message that our pay has been eroded for far too long and it’s time to drop the 1% cap and negotiate increases in our pay. Our payday protests will send a powerful message to government that we need and deserve a decent pay rise and will back up our national pay claim to the Cabinet Office minister Ben Gummer and the head of the civil service Jeremy Heywood. All workers have seen their wages cut in real terms since the financial crisis hit 10 years ago. In some areas public sector workers are now in the ninth year of a pay freeze. While the rich have got richer, it has been a lost decade for workers and their families. As one PCS member has said: “There is too much month left at the end of the money”. 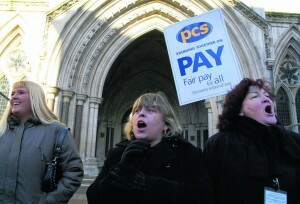 At last September’s TUC Congress, the PCS motion calling for co-ordinated action on pay was passed. These protests are an ideal opportunity to the lay the basis for it. Find out where the PCS protests are and join them. Bring along your union and trades council banners and flags. Fight together for a pay rise! There is a protest at 1pm outside the Treasury. Details of this and the other events are here. ← NSSN 333: Teaching Assistants still fighting in Derby and Durham!